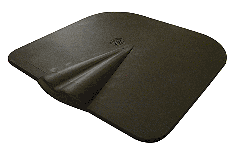 The PM Hoof Pad Wedge is an aid to eliminate increased strain on tendons, heels and soles. 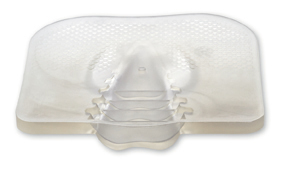 The PM Hoof Pad Wedge shows like the PM Hoof Pad Flat a tendon-supporting effect by its frog-shaped concavity – leading to a statics/balance improvement similar to the one of an closed-bar shoe (e.g. egg-bar shoe). Furthermore, it offers a much better pressure distribution on frog and sole. 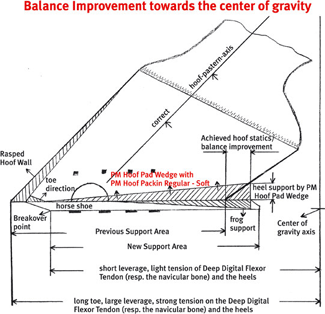 The outstanding extra benefit of the PM Hoof Pad Wedge is the enlargement of the weight bearing area of the heels that results in an optimized weight and pressure distribution. 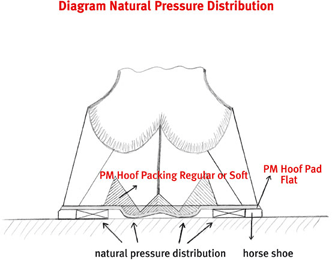 For this, the PM Hoof Pad Wedge must be applied as shown in the figure. By lowering the heels, the weight-bearing area is substantially increased. Then the PM Hoof Pad Wedge fits in the space of the removed heel part and keeps a correct hoof-pastern axis. The left space between hoof and the PM Hoof Pad Wedge is filled with PM Hoof Packing Regular or Soft. The PM Hoof Pad Wedge is available in specialized trade for horse shoeing equipment and in two sizes (180 mm wide, 185 mm long, 10 mm thick or 145 mm wide, 150 mm long and 9 mm thick). 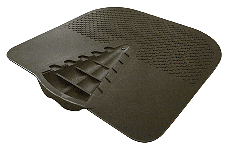 The PM Hoof Pad Flat is an aid to eliminate increased strain on tendons, heels and soles. The PM Hoof Pad Flat shows a tendon-supporting effect by its frog-shaped concavity – leading to a statics/balance improvement similar to the one of an closed-bar shoe (e.g. egg-bar shoe). In addition it offers a much better pressure distribution on frog and sole, which is the outstanding benefit. The left space between hoof and the PM Hoof Pad Flat is then filled with PM Hoof Packing Regular or Soft.